When you head off to college and are away from your parents for the first time, the idea of missing out on family traditions is a serious one. Sometimes you get lucky and get the chance to go home and partake in the comforts of traditions. But if your parents live far away or you are way too busy to break away from campus for a weekend, it becomes your responsibility to craft some traditions of your own. One of my favorite traditions growing up was that my parents and I had always gone to a tree farm to cut down what we deemed the perfect Christmas tree. The tree farm that we went to was just about as New England as you could get because it had a horse-drawn carriage that would bring you to the trees and was flanked by two ponds surrounded by cattails. To say I missed going to the tree farm would be an understatement because it was always one of my favorite things about Christmas and what made me hate the artificial tree that is now in my Texas home. Thankfully, two lovely individuals who I refer to as my “Albany parents” invited me to go find a tree with them. Although the tree farms in the area are not too similar to the vast New England ones that I am used to, I was elated to see some familiar parallels. The best was the debate on the tree as it reminded me of my family and how we would disagree on what the perfect tree actually looked like. It appears that most people cannot agree on what is too tall, too short, too skinny, or too fat when it comes to a Christmas spruce and that is what I liked the most. After my Christmas tree adventure, I met up with some of my residence life staff to head down to The Plaza to see them light the giant Christmas Tree that sits beautifully between the buildings. This was really cool because in addition to seeing the tree there were also fireworks, and a moment with my RA staff never proves to be a dull one. 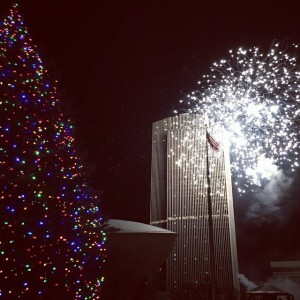 As the fireworks reflected against the architecture of the capital, I could not help but to think that creating your own holiday traditions might not be that bad. This was affirmed when my friend Myles pretended to propose to me under the tree- although I must say when you are 21 and 23 proposals do not really look that fake and I ran away before people started clapping. After the fireworks were over my RA friends and I got lost in The Plaza trying to find our way back to the car. Like any responsible adults, we decided to make a shortcut and jumped a few barricades, loudly hummed some spy themes, and ran back to an area that wasn’t cordoned off. Spending the holidays away from your family is sad at times, but when you have opportunities to create your own traditions and memories with people who function like a different kind of family, everything seems okay. I find this especially true because I was surrounded by people who I like to spend time with, in a city that I have learned to call my home, and I laughed more than I would have if I stayed home.